Diamond's last trial. He is seen in profile at the left of the white-haired man seated with his back to the camera. 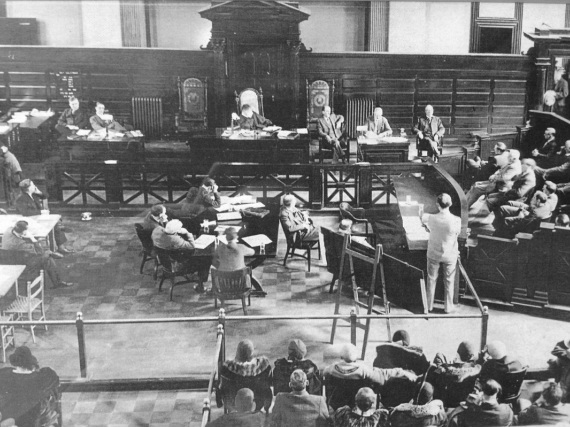 Diamond at his bail hearing. On April 21, 1931, Diamond was arrested yet again, this time on a warrant from Catskill, N.Y., on assault charges for the Parks beating in 1930. Two days later, he posted a $25,000 bond and was released. 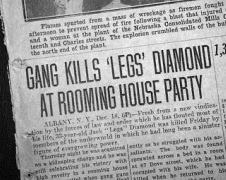 A week later, on April 27, Diamond was again shot and wounded, this time at the Aratoga Inn, a road house near Cairo. 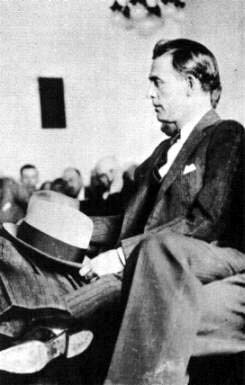 The Aratoga was owned and managed by Jimmy Wynne, who had extensive underworld connections. A popular area nightclub, the Aratoga was also a hangout for gangsters. Diamond had just finished eating with three companions and as he awaited a call from his attorney, he stepped to the front door for some air. Gunmen dressed as duck hunters and sitting in a car near the door, opened fire. Diamond, again hit several times, was driven by a local resident to a hospital in Albany, where he treated for his injuries. But his troubles were far from over. On May 1, while still in the hospital, New York State Troopers seized more than $5,000 worth of illegal beer and alcohol from Diamond's hiding places in Cairo and at the Aratoga Inn. He was arrested and charged. In August, Diamond went on trial for bootlegging. He was convicted and sentenced to four years in state prison. In September, Diamond appealed his conviction and his bail continued as he awaited the outcome of that appeal. 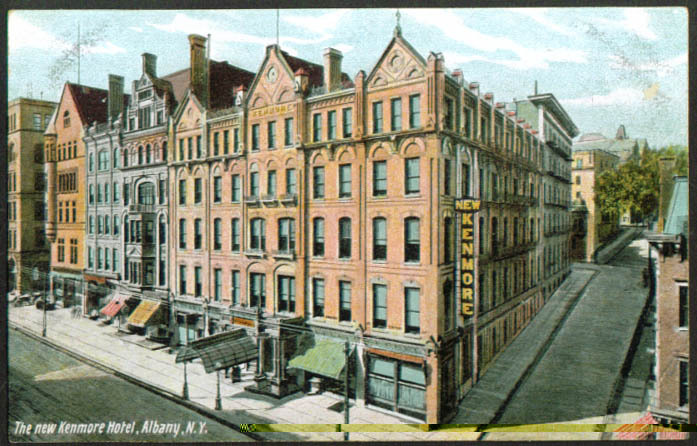 The Kenmore Hotel was the scene of his final celebration. Diamond leaves court, a free man, on Dec. 17, 1931.
assault and kidnapping charges stemming from the 1930 incident. On Dec. 17, he was acquitted and that night he and his family and a few friends celebrated In the Rainbow Room of the Kenmore Hotel, Albany’s best hotel. At about 1 a.m. on Dec. 18, Diamond left the party and went to visit his mistress, Marion "Kiki" Roberts, who was staying at 21 Ten Broeck St.
Roberts had attended the celebration party, but left at about 11 p.m. Diamond stayed at her place until about 4:30 a.m., when, according to witnesses, he was driven to 67 Dove St. in Albany, a private rooming house, where he was staying while on trial in Troy. He entered the locked front door with his key and went upstairs to his room and passed out on the bed. According to reports, shortly after his arrival, a large black car which had been parked down the street much of the evening, pulled up in front of the house. Two men got out and entered the main door using a key. They quickly went upstairs and, apparently using a second key, (some reports say Diamond had left the key to his room in the door) entered the room. Diamond was asleep on the bed in his underwear. While one man held down Diamond, the other shot him three times in the head. They ran from the room, but halfway down the stairs, one of the gunman returned to the room and shot Diamond several more times. The landlady, Mrs. Laura Woods, who was awakened by the commotion, said the gunman who remained on the stairs said, “Oh hell, that’s enough, come on.” The pair then run out of the house and sped away in their car. Minutes later, at about 5 a.m., Mrs. Woods telephoned Alice Diamond, who was staying nearby. She had been instructed to do so if there was any trouble. Within minutes, Alice, a business associate and Diamond's 8-year-old nephew, Eddie, arrived. Alice entered the room and screamed, “My God, Jack. What have they done to you?” She then wiped the blood from his face with a towel as an ambulance and police were called. Like many gangland slayings, the case was never solved, but there has been much speculation as to who was responsible. The most likely candidates, according to crime historians, include Dutch Schultz, the Oley Brothers (local thugs), or relatives of the Cassidy brothers who had been shot at the Hotsy Totsy Club. The most likely story, however, comes from noted author William Kennedy, who has written extensively on Upstate New York's history. In his book “O, Albany,” it was former Democratic Party Chairman Dan O'Connell, who ran the local political machine at the time, who ordered Diamond's execution, which was carried out by the Albany police. In a 1974 interview with Kennedy, an elderly O'Connell talked about Diamond’s desire to establish a protection racket in Albany. Diamond was warned off by the political machine and told to leave the city. O'Connell said that William Fitzpatrick (an Albany police sergeant who later became the chief) and Diamond were "sitting in the same room and (when Diamond left, Fitzpatrick) followed him out. Fitzpatrick told him he'd kill him if he didn't keep going." Given the power that the O'Connell political machine held in Albany at the time and its determination to prevent organized crime - other than its own - from establishing itself in the city, this account is easy to accept. To add substance to it, other machine officials confirmed the story over the years. 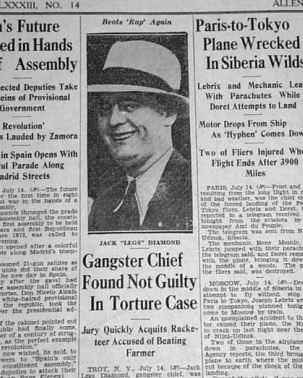 Chief Fitzpatrick himself was shot and killed in his own office by an Albany police detective, John McElveney, in 1945. McElveney was sentenced to 20 years to life in prison, but was released in 1957, when his sentence was commuted by then-Gov. Averell Harriman. Diamond was buried in Mt. Olivet Cemetery in the Maspeth section of Queens on Dec. 23, 1931. There was no church service or graveside ceremony. The burial was attended by Alice, her sister and brother-in-law, three nieces, a cousin, about a dozen reporters and more than 200 spectators. No underworld figures were spotted, nor did any send flowers. 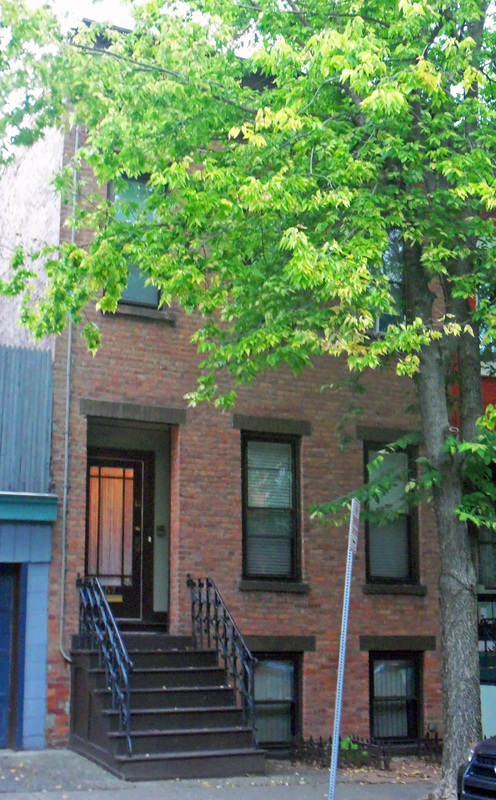 On July 1, 1933, Alice Kenny Diamond, was found shot to death in her Brooklyn apartment. It was speculated that she was shot by Diamond's enemies to keep her quiet, but that was never confirmed. Like Diamond’s murder, hers was never solved. Newspaper accounts of Diamond's troubles, and a 1960s paperback book on his life. 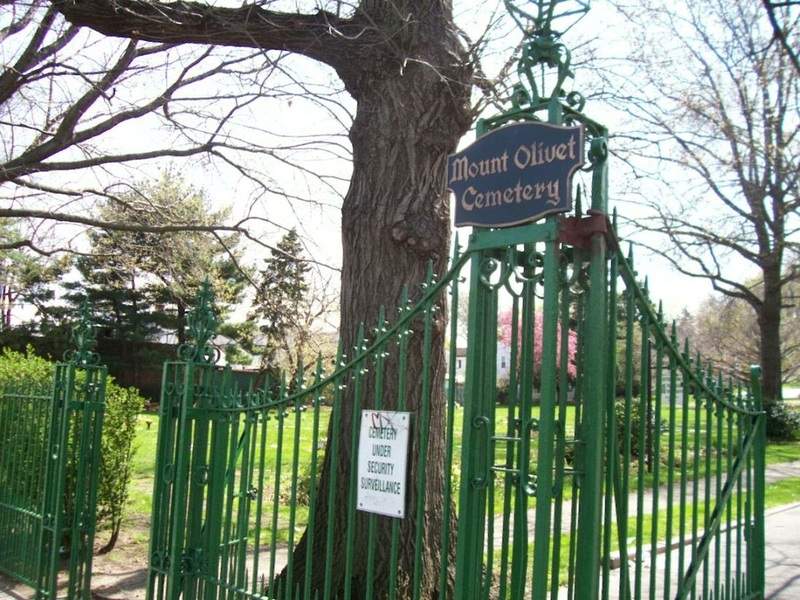 The cemetery where Diamond is buried, above, and the house at 67 Dove St., in Albany, where Diamond died.